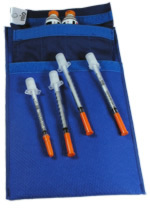 The Insulin Protector case keeps insulin cool for up to 16 hours and is perfect for daily use or short trips. This diabetic carrying case comes with two refreezeable cooler packs. Keep one in the freezer while the other one is in use. Carries up to two bottles of any brand of insulin and has pockets for syringes and alcohol swabs. This diabetes carrying case is very compact and is ideal when only a minimal amount of supplies are required. Made of Cordura Plus material and is available in black and blue. Size is 8 in x 4 in x 3 in. Additional cooler is sold separately. This product was added to our catalog on Sunday 03 July, 2005.